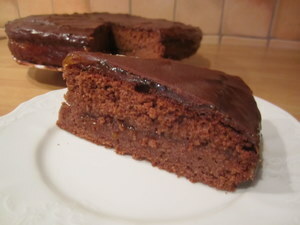 I will show you how to make a world famous and incredibly tasty Austrian chocolate cake, originally called Sachertorte. 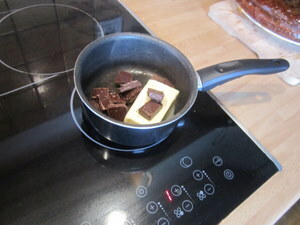 Cut 150g of butter and 150g of dark chocolate into smaller pieces and put them into a bowl. 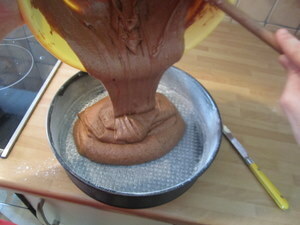 Better chocolate you use, tastier the outcome will be. We need to melt butter and chocolate. 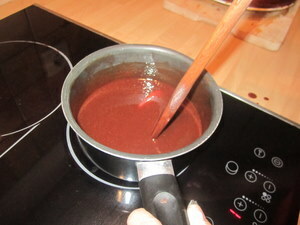 The best way to do this is to put the bowl into another bowl with very hot water (see picture). 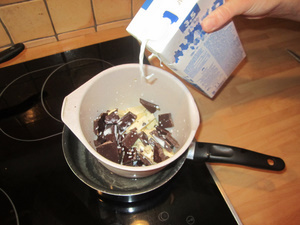 Pour one or two spoons of milk over butter and chocolate. 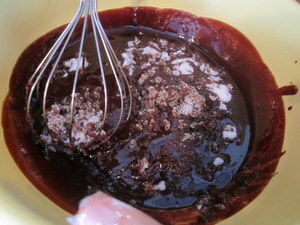 Keep stirring until the butter and chocolate melt and you get a silky smooth chocolate mixture. 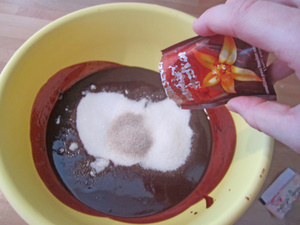 Pour the mixture into a bigger fresh bowl. And a bag of vanilla sugar. I've used a bourbon vanilla sugar. Separate yolk from the egg white. 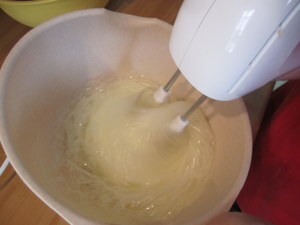 Put the yolks into a mixture and white into another bowl. 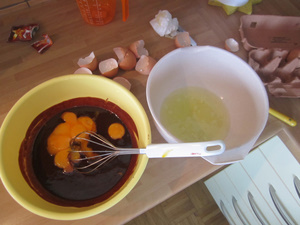 Stir the yolks into a mixture. 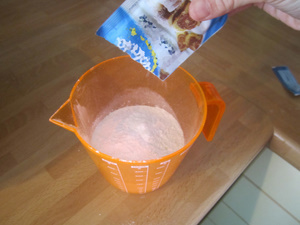 Put 150g of flour moke and half a bag of baking powder pecilnega praška together and stir it up. 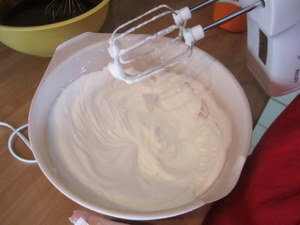 Stir the egg white with a mixer. Keep stirring until it gets hard. If you turn the bowl over it should stick right to the bowl and shouldn't fall out. 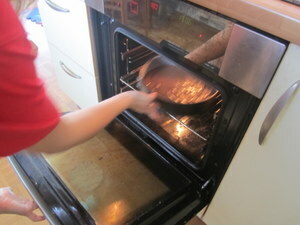 Now turn on the oven and set it to 180C (356F). 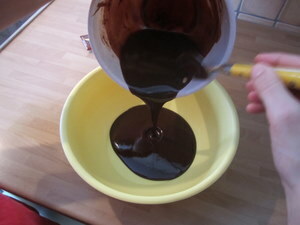 ... and then flour mixture you prepared earlier into a chocolate mixture. 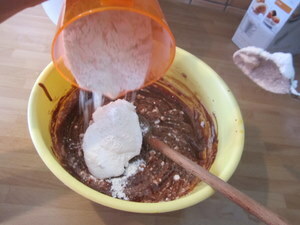 You can add both item gradually, a bit of egg white then flour, you stir it, then again a bit of egg white then flour again you mix it, and so on. 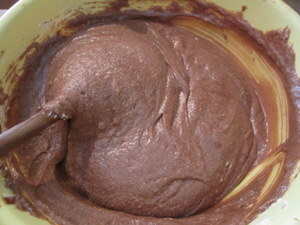 This is how the mixture should look like at this point. 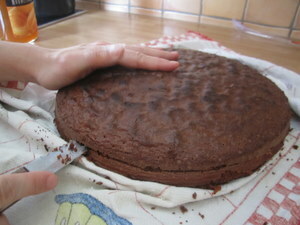 Put it into a with butter greased baking tray. You can use baking paper as well. Put it into an oven. The oven should be heated up to 180C (356F) by now. 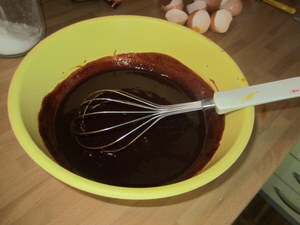 Let it bake for about 1 hour at a temperature of 180C (356F). 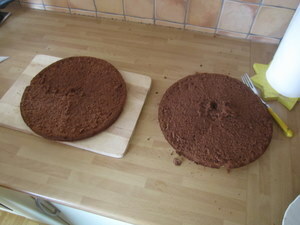 After an hour take the cake base out of the oven, let it cool down and cut it into half (see picture). Turn the upper half over, so we can soak it a bit. 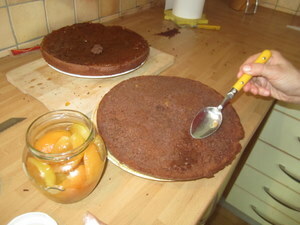 Take the juice out of the apricot compote and pour it over the both halfs of the cake. I've used about 1dl of compote, you can use rum as well if you like the taste of it. 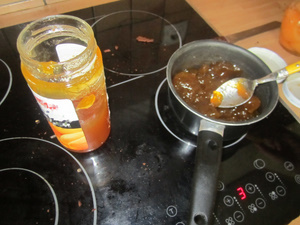 Now put the apricot jam into a bowl and let is slowly melt on a low temperature so it becomes smoother. 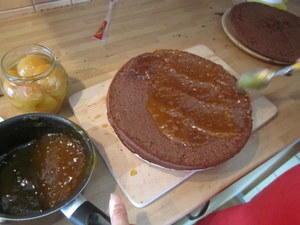 Spread the apricot jam evenly on to the lower half of the cake. 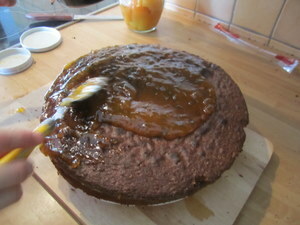 Put a bit more of the apricot juice over the upper half of the cake and put it back on the cake. Spread the rest of the jam over the cake. 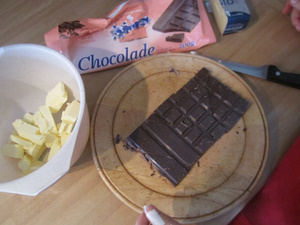 Again, melt 100g of butter and 100g of dark chocolate. You can use the same "hot water bath" technique you used earlier. Keep stirring it so it doesn't stick to the bowl. 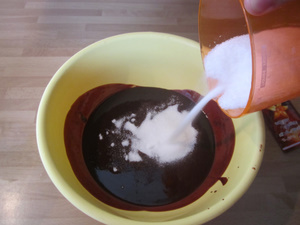 When the mixture becomes silky smooth, pour it over the cake. 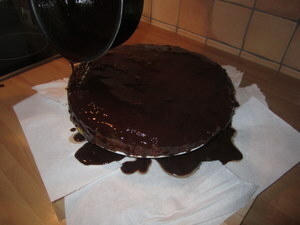 And you are done, enjoy your Sachertorte, bon appetit! Let me know how it turned out for you on the forum. Apple strudel is a popular desert in Austria and in many countries in Europe that once belonged to the Austro-Hungarian empire. Let me walk you through the process of making a tasty apple strudel of your own. Simple fruit dessert, whit delicious apricots, of course, you can also add any other fruit, and thus satisfy all tastes. 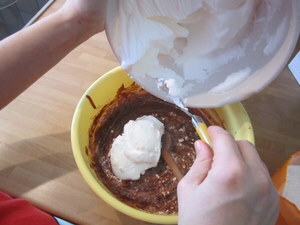 Did you know making a delicious tiramisu is quite simple? Did you know that tiramisu means 'take me' in Italian? This is an excellent idea to surprise your guests. 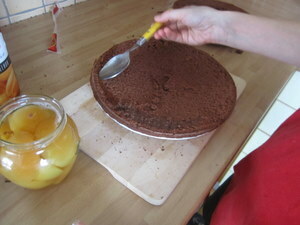 We will show you how to prepare a Chocolate cake with apples. The recipe gave us a very nice lady from the neighborhood. 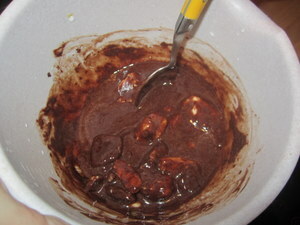 A home made version of marshmallows or pastry with cream and chocolate. Crazy tasty and easy to make, what more could we want? Have a go at baking this classic among the homemade sweets, super delicious homemade walnut cookies. So tasty, yet so simple to make.